Kazama Kagetora is the young ninja from the hidden village of Hoorai. He has been given a great duty, honor - to serve the Toudou family, who are most skilled in martal arts. So, Kagetora ends up being a martal arts tutor to the Toudou family's daughter, Yuki (Hime, as Kagetora her calls). Kagetora realizes his feelings for Yuki and even if he tries to deny them, they just get stronger. It is not forgiveable for ninja, especially an oyakume to fall in love with his/hers master, so he decides to hide them. Kagetora has always wished to become an oyakume and that's why trained very hard. 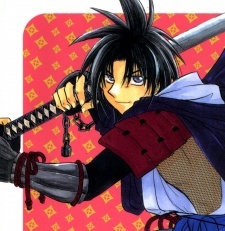 His ninja pet is Kosuke, a ninja monkey (which is funny cause his name is "KageTORA"=tiger). He is the youngest child in his family. He has two brothers, his mother died when he was young, and his father's not much home. Even though he is a great ninja for his age, he still has a flaw. He is totally, scared, of ghosts! !